In New Book, Former Atlanta Teacher Blames Education Policy For Cheating Scandal Shani Robinson was one of 11 Atlanta teachers convicted of altering standardized test results in 2015. In None of the Above, she pleads her innocence — and points a finger at systemic failure. In 2011, Emma Hutchinson School was one of the Atlanta Public Schools identified by a state government report as part of a widespread cheating scandal. In 2015, a verdict was delivered on the cheating scandal in Atlanta Public Schools. A 2011 Georgia state report found unethical behavior in the school system, including teachers and principals changing wrong answers on standardized tests. Two years later, a grand jury indicted the Atlanta school superintendent and 34 other educators. Some agreed to lesser charges; 12 eventually went to trial, and all but one of them were found guilty of racketeering in 2015 — a felony charge often used to prosecute the mafia. Shani Robinson was one of those found guilty, but has continued to maintain her innocence. In an interview, she says she could not take a plea deal, even though she was pregnant during the trial (and gave birth shortly after it). "Because I know that I'm on the right side of justice," Robinson says. "And I even get emotional talking about it. But the thought of being blamed for something that I did not do is horrifying. ... Here I was facing 25 years in prison for something that I didn't do, and I felt like if I was on the right side of justice, that one day I would be vindicated. That was the moment that I decided that I would never take a plea deal." She is free now, pending appeal, and in the meantime has made her case in a new book, written with Anna Simonton. 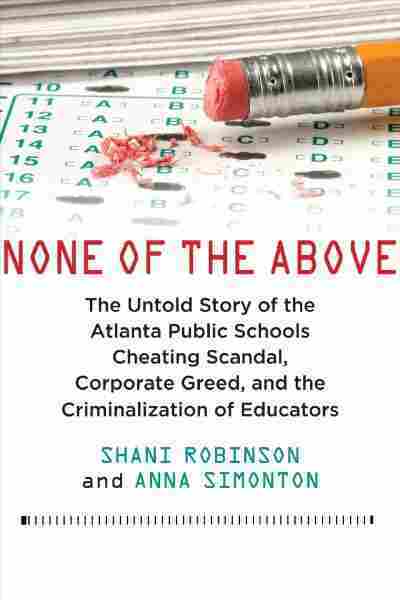 It's called None of the Above: The Untold Story of the Atlanta Public Schools Cheating Scandal, Corporate Greed, and the Criminalization of Educators. I wrote this book for my son. It started off as a journal and I wanted him to know the truth about what actually happened to me when he got older. And I also wrote this book to set the record straight, and to ask the question: Who should really be held accountable for cheating the children? Our children have been cheated by those who have willfully torn apart black communities through displacement and gentrification, underfunded and privatized public schools, and then have criminalized black educators for a dysfunctional system that was designed to fail. ... 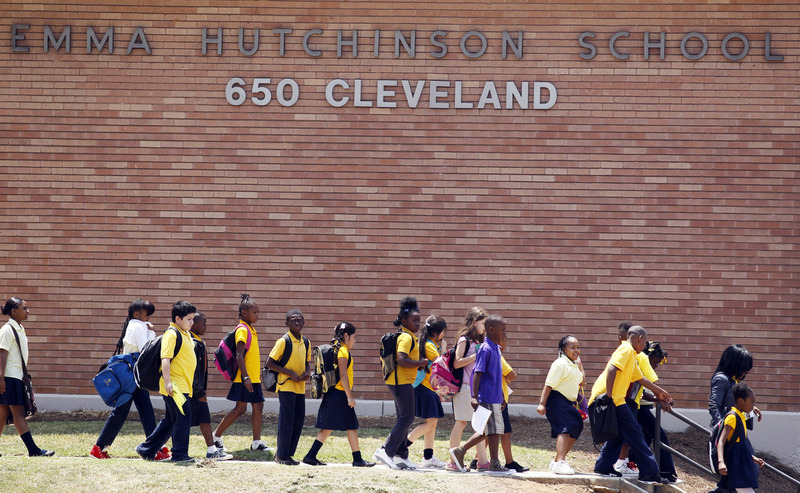 I feel like this case is extremely important because public education is under attack, as we've seen in places where teachers are striking, and the cheating scandal was used to portray public education as a failure and justify privatizing schools. And so many people are resisting that right now. And so we believe that, you know, winning the freedom of Atlanta teachers will be a win for educators everywhere. Robinson: Well, that's a good question, because when you think about cheating on standardized tests, this is something that was happening over the entire country. Over 40 states have had cheating allegations — 14 of those states, it's been known to be widespread cheating. In Washington, D.C. there were 103 schools that were flagged for high levels of suspiciously high test scores. And so to think that what happened in Atlanta was, you know, like an anomaly — you know, that was the biggest thing: Why were the educators in Atlanta charged with racketeering when this was happening over the entire country? And in the book we outline Atlanta's history of displacement and the destruction of black communities. And I think the criminalization of black educators was the next legacy in that history. Martin: But why? I mean, what's your argument for why this happened in this place at this time? I mean, Atlanta has an African-American mayor, the DA is African-American, the two prosecutors are African-American — I mean, what would be their motive? Robinson: You know, I don't have the answer to that, you know. I don't. Martin: But you seem to think race played a role. Robinson: I absolutely think race played a role. ... There were some white educators who were implicated in that GBI [Georgia Bureau of Investigation] report, and none of them were indicted. And I can't help to think that if it was 35 white educators, that it would have gotten to this point where they were charged with racketeering. You know, there were some people who testified during the trial that they only took a plea deal because they were stressed out from the entire ordeal. And some people, you know, they actually blamed it on No Child Left Behind, that they don't want their schools to close — because under the No Child Left Behind Act, after a certain number of years, they could close your school, they could turn it into a charter school or could be taken over by the state. And so I was facing 25 years in prison; there were some people who were facing 40 years in prison. And so we had that option, of facing decades in prison, or doing community service saying that we're guilty, you know, and maybe paying a fine. And so that was a tough decision to make: Having to spend decades in prison or just say that you're guilty. Absolutely. Absolutely. The education officials and policymakers that have pushed high-stakes testing — that is who has cheated these children. That is who is guilty. Which is why you have all of these states that have had high levels of erasures, and no one has done anything about it. Liz Baker, Gemma Watters and Denise Couture produced and edited this interview for broadcast. Patrick Jarenwattananon adapted it for the Web.